Favorite athletic event: Run to Remember Half Marathon held on the Sunday of Memorial Day weekend. Flat and fast course with just the right number of runners - not too many or too few. I’ve been running this race since the 90s back when it was held in Melrose, MA. It definitely wasn’t flat then. What is your background as an athlete? I ran track in high school, not very seriously. It was in graduate school in the late 80s that I discovered running to relieve stress but also to set goals and achieve them. I’ve run five marathons over the last 20 years with a P.R. of 4:05, and an uncountable number of other races varying from 5K to half marathon. I have also always enjoyed hiking - including conquering Mt. Marcy with my husband and our then seven year old, to now hiking Mt. Monadnock or the Lincoln-Lafayette loop in the White Mountains. Describe your most challenging athletic event/experience to date. The sprint triathlon that I completed this past summer. Why? I’m a runner and a biker, but have never been a very adept swimmer and pretty much had to relearn to swim. I swam off and on for six months to train, but had never completed more than 150 yards without stopping before race. For the triathlon, I had to complete a 0.5-mile swim. I raced with a friend who used to be a lifeguard – she got me through the swim portion. I also rested a lot on my back. She wasn’t much of a biker, and I encouraged her through that portion of the race. 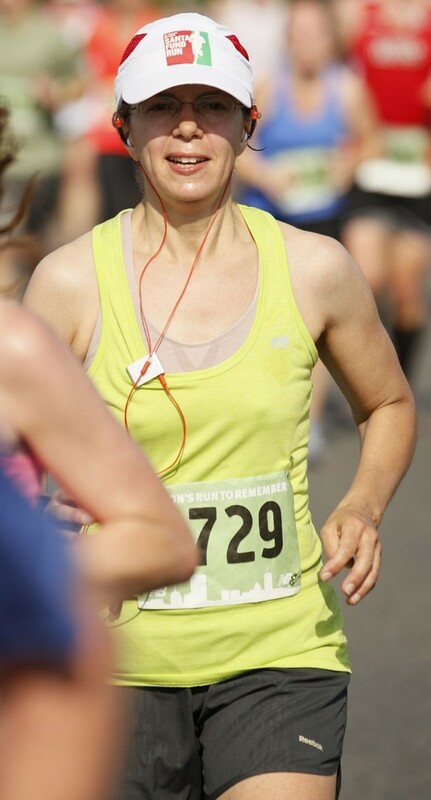 The photo is from the run portion of that race - can’t tell you how tired I was at that point. What have you chosen as your transformative event for Fit to Lead Boston and why? I have chosen the Pan Mass Challenge which is a 200-mile ride from Sturbridge to Provincetown because 1) the longest I’ve biked is 35 miles so this will definitely be a fitness challenge and 2) it requires raising money for the Dana Farber Cancer Center. Having lost family members much too early in their lives to cancer, this charity hits home for me. How does your experience as an athlete transfer to the workplace? It translates in several ways including dealing with unexpected obstacles and less than desirable conditions, balancing when to be a leader or a team player (e.g. during training sessions or relay races), setting goals and achieving them, and practice, practice, practice – sometimes we forget that practicing applies to work as well as athletic training. Name a random, fun fact about yourself: While in graduate school, I took up spelunking - what a trip that was - crawling through small, tight passage ways in mud, always the fear of waking sleeping bats, rappelling down into dark spaces not exactly certain where the bottom was….